Watching the sun rise or set over the sand dunes of Merzouga may be the most spectacular experience you have on your trip to Morocco. 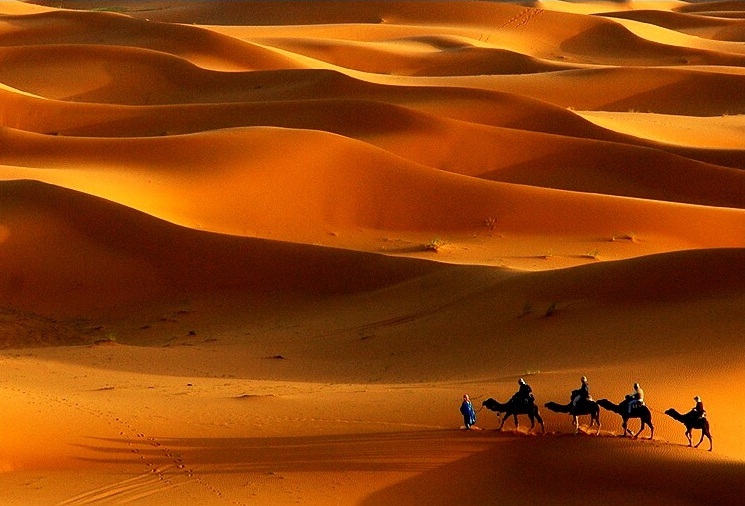 The Erg Chebbi, the name of these sand dunes, is said to have some of the highest dunes in Morocco. Indeed, the dunes and the desert wildlife are impressive. The dunes of Erg Chebbi are a strikingly strange natural formation. From the top of the flattest area you could imagine, suddenly a long mountain of sand rises. This mountain is surrounded by flat and desolate nature on all sides, and you could end up wondering if it really is real. But so it is, even if its existence is so weird that it has given rise to legends and myths among the locals. One legend tells us that the dunes of Erg Chebbi were created by God as a punishment to the locals of nearby Merzouga after they refused to give shelter to a woman and her child during a local festival. A sandstorm came, and buried the village of Merzouga is it was then. This is one of my favourite photos I’ve ever taken, and has also been one of the most appreciated through time. It was taken from one high dune late afternoon. Unfortunately I only had up to 70mm lens and this is quite big crop. Czech nomad Lucie Debelkova is a roving travel and landscape photographer for The WideAngle network. She has covered assignments in more than 70 countries. For images by The WideAngle photographers, please take a look here. Stunning photo! The composition is great. Man …your everywhere and it’s good to see your still going …great shot as always. Thanks for sharing Northern Plights. How’s that for a bit of Parallel World’s culture shock? Lucie is one of several great great talents in The WideAngle. It’s great to have her on the crew and to have permission to use such stunning shots here. (Oh. Yeah, and The Housemartins are still cool).